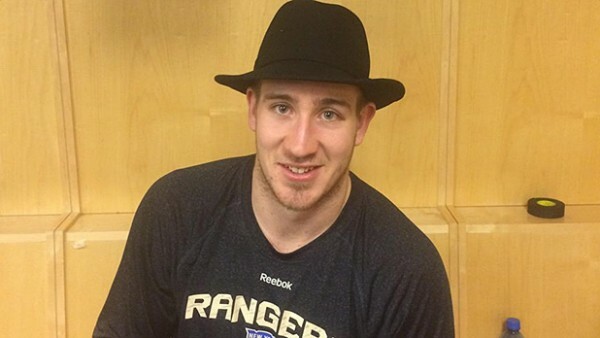 Kevin Hayes won a playoff game for the New York Rangers in sudden-death overtime Wednesday night, and for his heroic effort in front of the enemy net, he was handed a black fedora from teammate Dan Girardi. In accordance with Rangers tradition since 2012, when the famed Broadway Hat was first introduced, the 6-foot-5 Hayes fielded questions from the media with that little hat sitting atop his head. The Broadway Hat is awarded only after wins, and only the last player to earn the coveted fedora decides who gets to wear it next. Players are rewarded for hard work, effort, or in Hayes’s case, some scrappy play at the right moment. In three seasons since it became a part of Rangers lore, the Broadway Hat is now a hockey celebrity with 20,000 Twitter followers, and, occasionally, sharp words aimed at the hated Islanders. Hockey is a sport drenched in time-honored traditions, like players refusing to touch certain trophies, or not shaving for two months during the playoffs, or throwing a perfectly good hat on the ice when someone scores three goals in a game. From throwing octopi over the glass in Detroit to raining rats in Florida, the NHL tops all other professional sports in the sheer number of quirky customs it owns. So in passing the Broadway Hat, the Rangers are not pioneers. The Blueshirts didn’t invent postgame trophies. Virtually every NHL team has a signature item that’s given to the MVP after each win. The Washington Capitals dress their “Honest Abe” player of the game in an stovepipe hat and beard. The Islanders hand off a bomber jacket to their best man. The Chicago Blackhawks pass around the Championship Belt. The Flames award the hardest working player in the room a Calgary Fire Department helmet. Through the years, NHL teams have used shovels, hardhats, military fatigues, and possessions of fallen teammates to acknowledge a job well done. There are vintage hockey images of a 1960s-era Jean Beliveau in postgame media scrums, still in his sweat-soaked gear, with a little black fedora atop his head. In the zany world of campy hockey traditions, that hat was probably placed there by a teammate. And every player who wears the Broadway Hat then gets the honor of placing the next piece in the magnetic Stanley Cup puzzle, another new hockey tradiation. There are 16 pieces to the puzzle, representing one for each win you need to hoist the Cup. Sixteen wins. Sixteen puzzle pieces. Sixteen Broadway Hats. If the Rangers play it right, that hat may wind up atop the Stanley Cup in a few weeks. Or maybe a fireman’s helmet will be on it. Or a championship belt will be wrapped around it’s ever-growing base. And then it will be time for the NHL to put all of its toys back where they belong for the summer.